If you're like me, you probably rarely find talk of trade agreements terribly interesting — that is, until Hillary Clinton gets involved. 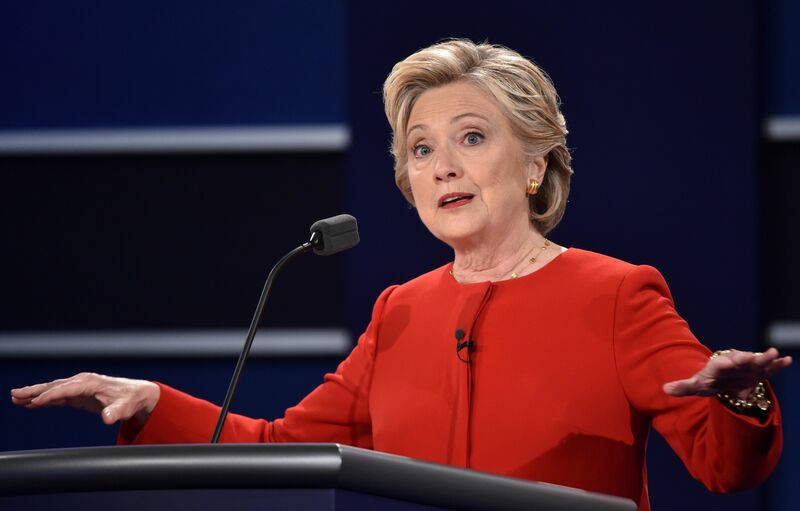 During Monday's presidential debate, Clinton called Donald Trump out during talk of NAFTA, the North American Free Trade Agreement that they've clearly decided to agree-to-disagree over. It was perhaps the most memorable moment of the night — about an issue that many young voters may easily forget. As its name suggests, NAFTA guarantees free trade between the U.S., Canada, and Mexico. It's primarily Mexico that Trump seems concerned with. He has previously said that NAFTA has "destroyed our country," arguing that the deal caused a sharp decline in manufacturing jobs throughout the U.S.
Conveniently for Trump, his opponent's husband, former President Bill Clinton, actually signed NAFTA into law in 1993. During Monday's presidential debate at Hofstra University in New York, Trump claimed that now-candidate Hillary supported NAFTA. As he often does, Trump linked the former president's actions with those of his wife, but she took the opportunity on the debate stage to set the record straight. "Donald, I know you live in your own reality," Clinton said, "but that is not the facts." It's pretty safe to assume that most young American voters aren't basing their decision at the polls on NAFTA, or on any other trade deal that the candidates bring up for that matter. It's not that these deals are irrelevant to young voters. After all, they're economic in nature, and the economy is a top concern for voters, in general, year after year and election after election. But young voters seem more concerned with some of the other issues discussed at Monday's debate, including gun violence, race relations, and climate change. For instance, a USA TODAY/Rock the Vote poll revealed back in January that the youngest voting-eligible generation cares most about student debt or renewable energy. While millennials are certainly concerned about the economy, they may cast a vote that's based more on college affordability than NAFTA. Any young voter watching Monday's debate should remember NAFTA, though. It's not just the trade deal that your bitter relative complains about over holiday dinners during an election year. It's a piece of legislation that Clinton has had to "evolve" on — an evolution that Trump won't let her forget. Clinton tried to put Trump's criticisms to rest on the debate stage with her memorable one-liner, and, in doing so, she may have just turned trade talk into a topic of renewed and interesting conversation.